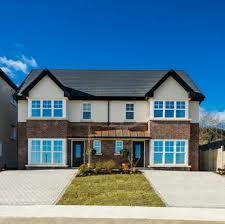 Project: Seagreen Greystones Co Wicklow – a development of 180 houses comprising of 3,4, and 5 bed sem-detached. 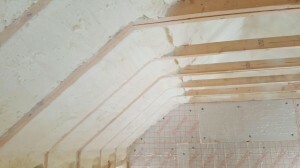 Solution: Cards were inserted between rafters to provide a 50mm ventilation channel, Open Cell spray foam was then sprayed to the back of cards. Open cell moulds itself to any wall shape or surface irregularity ensuring there is no possibility of gaps that would compromise airtightness performance. Client Quote: Jim Wood Director of Wood Group Homes made the decision to use Lyons Insulatons. “Using spray foam insulation has played a major part in getting these homes to an A2 rating. 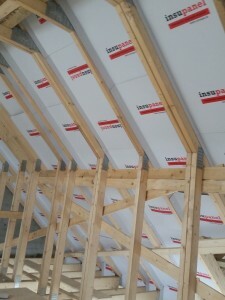 We have found that using spray foam instead of cutting and fitting insulation board has speeded up the whole insulation process on site, while providing an energy efficent home for our buyers”.